The G-20 meetings held regularly since 2008 have addressed the following goals and tasks for resolving global problems: ongoing sustainable growth of the world economy and ways to stabilize it; development of the financial and world infrastructure; guarantee of food safety; ways to resolve local and regional conflicts; and environmental protection. However, not one of the global projects advanced by the G20 states has been fundamentally discussed or implemented, and all of the above-mentioned goals have essentially remained declarative. Recognizing you as a talented contemporary leader, we are inviting you to initiate a discussion at the G20 summit in Buenos Aires of EURICAA, THE FIRST INTERNATIONAL GLOBAL INFRASTRUCTURAL PROJECT, capable of stabilizing the development of contemporary civilization and guaranteeing planetary protection of the environment. I would like to recommend beginning discussion of the EURICAA project at the G20 summit in 2018 in Argentina, thus ensuring that this meeting will not only be ceremonial, but truly address a global and important topic that will change the future of the entire planet. To achieve this, I ask that this topic be officially included on the G20 meeting agenda. This letter will be sent to all the presidents of the G20 member states and to the United Nations. EURICAA is an urgent response to China’s Silk Road Regional Project. EURICAA: EU – Europe, R – Russia, I – India, C – China, A – America, A – Africa. We would like to draw your attention to EURICAA, THE FIRST INTERNATIONAL GLOBAL INFRASTRUCTURAL PROJECT (EURICAA: EU – Europe, R – Russia, I – India, C – China, A – America, A – Africa). A detailed presentation of the project has been submitted to President of Argentina Mauricio Macri for discussion at the G20 meeting in November-December 2018, as well as to the presidents of all the G20 member states, the UN leaders in the hope of securing intellectual and financial support. In order to promote EURICAA, we suggest creating a Supervisory Board consisting of 89 members. The Supervisory Board will strive to coordinate endorsement of the project at UN venues and international economic forums, as well as participate directly in the project’s development, particularly its commercial aspect. The Supervisory Board will also be responsible for organizing tenders to carry out road work and create new types of transport with a capacity of 300 to 500 tons, as well as for building customs terminals, hotel complexes, atomic power plants, gas stations, and restaurants along EURICAA’s entire 70,000 km route. The Supervisory Board will also regulate and control national contributions to the EURICAA Development Fund from the member countries. Members of the Supervisory Board will not be responsible for financing the project itself, but will establish a EURICAA advancement fund (from which representation costs will be paid – hotels, transportation, maintaining the secretariat, renting of conference halls) and carrying out its main function – interacting with the planet’s political and engineering elite. The project will be financed by the UN and the budgets of all the world’s states. After building begins, it will take 20-25 years to complete the project. The preparatory stage, which includes discussion and planning at UN, G20 and international venues, will take 5-7 years. We suggest that you hold the first Supervisory Board meeting on 23-24 September 2018 in Marbella (Spain). If you are interested in this project, would be grateful to receive any feedback. This is not the first time that the author of this project, Alexander Potemkin, Doctor of Economics, is attempting to draw the attention of the heads of progressive states to significant global projects and bring them to successful fruition. To this end, he is proposing discussion of this topic at the G-20 meeting in Buenos Aires. He was one of the originators of duty-free trade in the CIS countries, has introduced new metrological standards in the global nano industry and created an international platform for discussing the danger of the uncontrolled development of artificial intelligence. He is also the author of intellectual books on the destiny and state of society. EuRICAA is a grandiose infrastructure plan for the 21st century. EuRICAA is an opportunity for our generation. IT WILL BECOME A GLOBALIZATION CENTER THAT UNITES MORE THAN SIX BILLION PEOPLE ON THE PLANET. THIS GLOBAL CIVILIZATION UNIFICATION PROJECT WILL PROMOTE WORLD TRANSPARENCY. IT IS THE MOST VITAL, THE MOST EXTRAVAGANT, AND THE MOST PROMISING PROJECT OF THE NEW MILLENIUM THAT WILL SAVE THE EARTH FROM A MAJOR ENVIRONMENTAL DISASTER. We hope that the leaders of the G-20 countries will consider this project to build a round-the-world highway at one of their upcoming meetings. A man cannot exist in a static world—in order to evolve, we must make qualitative changes in the way we live. Unfortunately, new opportunities to develop human potential frequently meet with opposition that threatens to destroy states and nations. However, today, at the beginning of the 21st century, more and more countries are declaring their will for peace and creativeness. The global community is increasingly turning its attention to humanity’s wellbeing, without wars and revolutionary upheavals. This has given birth to the idea of globalization and world transparency. It is hoped that development of the labor and capital market will give nations and states a new incentive to draw closer together. This will remove the last barriers to free movement and create an atmosphere of complete mutual trust. But which road will take us to this kind of future? And yes, we mean a road in the literal sense of this word. A look at history convinces us that all grandiose changes began with a road. Cyrus the Great, Alexander of Macedonia, the rulers of the Inca Empire, Rome, and Byzantium, Charlemagne, and Napoleon are good cases in point. The idea has emerged of creating a Global Transport Network—a civilization hub that will unite all of the Earth’s continents. We are talking about a Europe – Russia – America – India – China – Africa mega highway. This universal super long highway will help to bring states and nations out of their isolation. It will join dozens of countries in their pursuit of new diverse interests, such as high-speed, high-capacity freight services (around 500 tons), exotic travel itineraries, and opportunities for people of different nationalities, religions and races to take all kinds of business and private trips. The first section of the Global Transport Network—the EuRICAA Highway—will connect Europe with Russia, India, China, Japan, and America. It will be around seventy thousand kilometers in length. It will pass through territories inhabited by more than six billion people. The author of the idea believe that the highway could start in Gibraltar, where it will pass on through Madrid, Paris, Brussels, Berlin, Warsaw, Minsk, and then into the expanses of Russia. It will continue on through Tver and Vologda, crossing the Urals near Perm, to pass into Siberia, where it will reach Khanty Mansiisk, Surgut, and Yakutsk. From there, it is only a stone’s throw to Uelen, the easternmost settlement on the Russian mainland. On a clear day, you can see the Diomede Islands, the boundary separating Russia and America, from Uelen. Building a tunnel and bridges across the Dezhnev Strait and the Diomede Islands will accelerate the development of the Siberian regions and exploration of their riches and natural diversity. Instead of being the most remote points on the planet, the town of Wales on Cape Prince of Wales, which is the westernmost point of the North American continent, and Russia’s Uelen on the Eurasian sub-continent will become genial and welcoming symbols of the new global civilization of the third millennium. 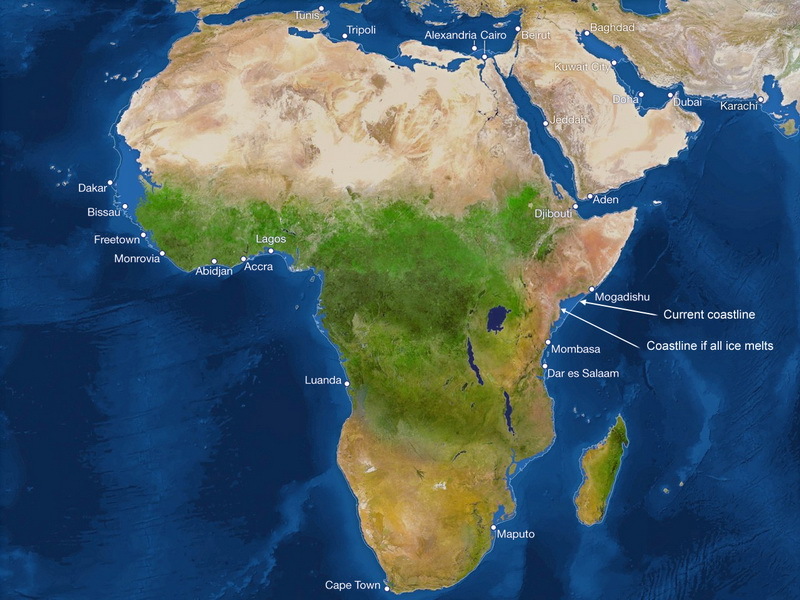 At the second stage of its construction, the mega highway will pass through Mexico and the Isthmus of Panama to Patagonia, the Argentine port of Ushuajja on the Tierra del Fuego, and from Lisbon throughout the length of Africa to Cape Town in South Africa. However, it will be the governments and people of the countries the road passes through who will make the final decision about building the Great EuRICAA Highway. It stands to reason that the more states and nations EuRICAA unites, the greater the benefit people will gain from it. The south meridian route will turn off the highway near Surgut. One of its branches through Central Asia and Afghanistan will reach India, another branch—the southeastern—will unite China and the Southeast Asian countries into a single transport system. Humanity urgently needs a single intercontinental transport artery capable of becoming the center of contemporary civilization. However, so far, only partial and feeble attempts have been made to bring this to fruition. The transport infrastructure in the developed countries—the U.S., Germany, France, Great Britain, Spain, Italy, Russia—is distinguished by impeccable quality and huge potential for further development and convergence with carrier service partners. But we are talking about an entirely new road that can handle articulated vehicles with a carrying capacity of around 500 tons controlled by automatic pilot systems. The EuRICAA highway and railway network will prevent arduous interruptions in freight services and unite the existing and newly created potential into a streamlined network. 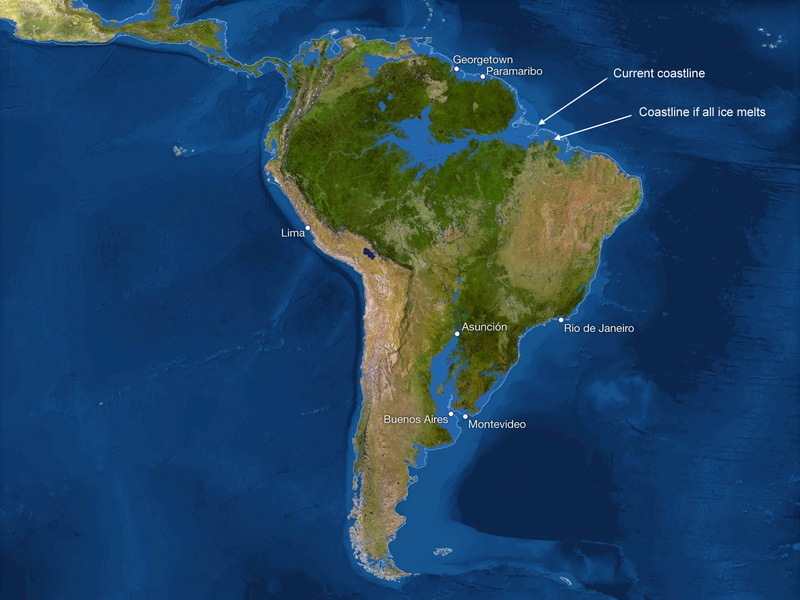 The 20th century has shown us ways to join territories separated by water. The most recent examples are the La Manche Tunnel and the bridge across the Biscayne Bay. Now we need to span the Bering Strait. From the technical viewpoint, this is not a terribly complicated task—the length of the bridge is no more than 20 kilometers at a sea depth of 40 m. However, it makes no sense to cross the Bering Strait if the EuRICAA Highway does not pass through Russian territory. It is this section that will become the key link in the entire project. Only by uniting Europe, Asia, America and Africa with a highway that passes through Russia (in addition to the Northern Sea Route and the Trans-Siberian Rail Road through the south of Russia) will it be possible to form civilization’s full-fledged intercontinental transport hub. There are many mineral deposits in Russia, Canada, the U.S., Latin America, and Africa, the resources of which have not been explored. To these can be added gas deposits that have even more impressive resources. Deposits of raw hydrocarbons, as well as coal, diamonds, gold, precious stones, base metals, uranium ores, iron, platinum, titanium, copper, tin, zinc, and rock crystal have been discovered (or are in the process of being surveyed) in the territories through which the highway will pass, or those adjacent to it. Thermal springs possessing high balneotherapeutic properties are also found here. And of course, there are forests, forests, and more forests, millions of hectares, billions of cubic meters of forests, which means not only raw material for the cellulose and paper industry, building business, and pharmacology, but also an inexhaustible giant oxygen plant, the significance of which is difficult to overestimate in light of the Kyoto Protocol. In the Yakutsk natural-raw material district, one of the world’s largest new gold-bearing deposits—Sukhoi Log—is waiting in the wings. Its reserves are such that they could yield half of today’s entire gold supplies. This is more than the total gold production of half of the planet’s countries. Many countries with tempestuously growing economies cannot wait to get their hands on all of these resources, primarily the neighboring industries of Japan, America, China, and others. 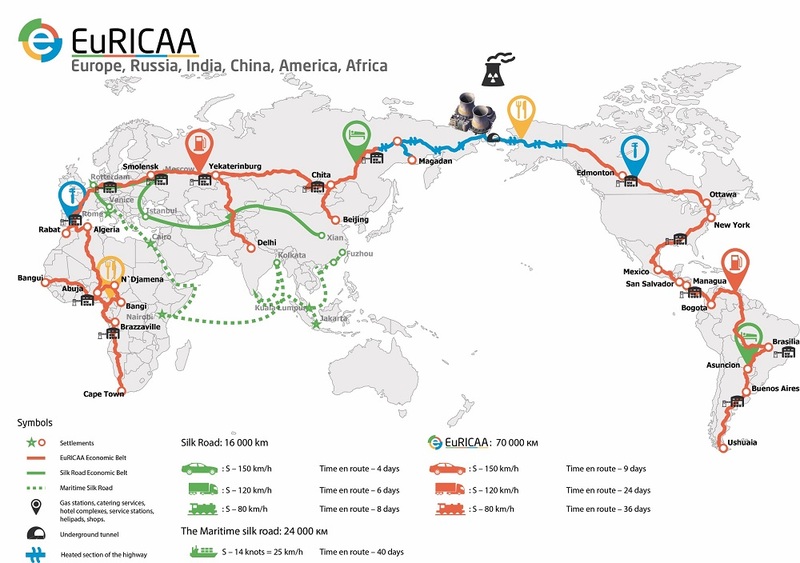 The EuRICAA mega highway will bring to life inaccessible regions of the world rich in potential. They will be incorporated into the global development trends of the national economies. The efficiency of corporate ties will dramatically grow, integration economic, political, and cultural processes will intensify, and investments will reach a qualitatively new level. According to the preliminary estimates, it will cost around five trillion dollars to build the EuRICAA mega highway. This sum includes the cost of a medium-capacity nuclear power plant; its energy will be needed to heat the road surface in Russia, the U.S., and Canada during the winter to avoid ice buildup. A EuRICAA Joint-Stock Company will need to be founded for managing the project and its step-by-step implementation. Is five trillion dollars a lot? Yes, it is an enormous sum. But building the highway will take twenty years. Annual financing of the project will amount to 100 billion dollars. This sum will be allotted by the U.S., European Union, India, China, Japan, Russia, and other countries, after the corresponding agreements have been reached, that is, it will be divided into eight parts. This is a little more than seven billion dollars a year, that is, 0.1% of the U.S. budget, or the total budget of the European Union. The allotted funds will stimulate economic growth in the participating states (purchase of the necessary road-building technology), lower the unemployment level (every participant in the joint-stock company will receive its own section of the highway and have the right to hire workers and engineers both at home and abroad, as well as use and purchase technology at their own discretion). The EuRICAA Joint-Stock Company is a commercial enterprise. After the mega highway goes into operation, it will begin earning money. The intercontinental highway will become a lively multifunctional corridor and begin to acquire commercial infrastructure –car repair shops, hotels, restaurants, rental shops, and tourist agencies. In addition to the global projects mentioned above, the resources of the territories adjacent to the Great Highway can be used: fish, wild game, furs, berries, mushrooms, recreational sports complexes… This will also generate enormous revenue. Every resident of the Earth must receive his/her share in the EuRICAA project. The appearance of an intercontinental mega highway will inevitably have an impact on global geopolitics. Various political alliances will begin to develop. These European and American alliances with their multimillion residents will be joined on entirely new principles. A multitude of states still on the margins of civilization and not in demand will join the world political system as its active and influential participants. The African continent, South America, and Southeast Asia will no longer feel like second fiddles far removed from the centers of international influence. There will be a radical re-estimation on a planetary level of the role and place of the member states in the EuRICAA project. The world has never engaged in anything as extensive or powerful before. Participation in the project will provide an opportunity to make expensive investments that will become more lucrative over time, super-advantageous investments with unlimited return. Investors will primarily be states that are able to contribute some of their budget funds. This will give the investor states a powerful boost for economic growth at the implementation stage by promoting the intensive development of road-building engineering, the design industry, and personal training spheres, as well as incorporating the vast army of unemployed currently living on benefits into construction. This super-capacity nature of the investment project will make it possible for both the largest transnational corporations and small companies, even private individuals, to participate in it. Thus the world stock-exchange market will acquire a new attractive asset, which will significantly enliven and activate the financial sector. In contrast to shady financial deals and virtual manipulations with securities, the EuRICAA project will provide its participants with a material equivalent of their investments. Operation of the mega highway is a new qualitative level for transnational management. EuRICAA envisages the creation of new managerial technologies and programs, a network of learning institutions for training new personnel, and a mass of prestigious vacancies. It stands to reason that the main investors will be transport companies with the opportunity to form and service global routes, companies specializing in the manufacture of road technology, and machine-building holdings that receive contracts for the manufacture of articulated vehicles with carrying capacities of more than 500 tons and operated by automatic pilot systems. Recently, when the idea for this project was being elaborated, the automobile industry was the first to respond and show its interest in participating in the project. EuRICAA will become a true school of learning, coming-of-age, and management for humanity’s upcoming generations. It will also become a symbol of heroic pioneering labor that every generation should have. EuRICAA is an opportunity for our generation. It is the most extravagant, most vital, and most promising idea of the beginning of the 21st century. It is an honor for compatriots and the world business elite to begin the century with a discussion of this Great Road project proposed by your peer. For more details, see the report on the procedure for calculating emissions. Carbon oxide differs from the majority of pollutants. It remains in the atmosphere for approximately one month and can be carried long distances. Although carbon monoxide is not a resilient greenhouse gas, its presence in the atmosphere has an effect on the concentration of other greenhouse gases, such as methane, tropospheric ozone and carbon dioxide. Incomplete fuel combustion leads to an artificial increase in the atmospheric carbon monoxide content. Motor transport and maritime traffic are the greatest perpetrators of such combustion. Carbon monoxide is detrimental to the health of living organisms. Carbon monoxide has an extremely toxic influence on humans. Having no colour or smell, it cannot be detected without special equipment. When it enters the body, carbon monoxide disrupts blood circulation, which in certain doses can lead to a fatal outcome. The concentration of carbon monoxide is especially high in large cities and densely populated areas where motor transport prevails, as well as in seaports, where ships have a significant impact on the local climate. At present, countries such as India and China, where the industrial boom is causing a rapid increase in the number of cars and fuel combustion, are at particular risk. Coal-fired power plants emit enormous amounts of sulphur. It is filtrates into the soil and water, thus disrupting the normal state of the ecosystem. The sulphur dioxide content in clouds increases the probability of acid rain, which destroys the fertility of land plots and reduces crop yield. People living near industrial regions close to highways and coal-fired power plants are at high risk. Nitrogen oxide is one of the main components in the formation of acid rain. Furthermore, nitrogen forms a so-called photochemical smog. It has a detrimental effect on the environment. Some crops, such as tobacco, tomatoes and spinach, are very sensitive to ozone, therefore photochemical smog can destroy these plants, along with other vegetation. It reduces the growth and productivity of trees and causes necrotic (dead) patterns on leaves. In the summertime, which is especially conducive to the formation of photochemical smog, the residents of large cities, where transport emits nitrogen oxide into the air, are subject to its relentless impact. Photochemical smog causes irreversible damage to the lungs and heart. Even the short-term impact of photochemical smog has a detrimental effect on young and old people alike. It causes irritation of the respiratory system – a decrease in pulmonary function and difficulty in breathing. It has a greater impact during physical exercise and other work in the open air. A high level of a smog also causes asthma attacks; people are more subject to allergens, which trigger asthma. According to estimates, about 400,000 people die every year from inhaling soot particles. The contribution of soot, or black carbon, to global warming has been underestimated. According to the latest data, soot ranks second after carbon dioxide in terms of its impact on global warming, thus relegating methane to third place. Because of its absorption effect, soot accelerates the thawing of snow and ice. This is especially noticeable in the northern hemisphere: in Canada, in the northern part of the U.S., in northern Europe and northern Asia. The fate of the planet in 20, 50, 100 years will depend on the decisions humanity makes today. Under the 2015 Paris Climate Agreement, the leaders of 185 countries agreed to keep the global temperature rise this century well below 2 degrees Celsius above pre-industrial levels (19th century). However, the increase in average global temperature is currently hovering around 3 degrees Celsius. Climate change was first recorded in 1860, and since then the average global temperature has increased by 2.7-3.2 degrees Celsius, while in the 20th century the sea level has risen by 10-20 cm. If greenhouse gas emissions continue at the same or a higher rate, the global air temperature will go on rising in the 21st century. In addition to global warming, pollutant emissions have a huge impact on other aspects of the life cycles on our planet: if the concentration of CO2 doubles, this will cause destruction of 40% of the northern forests. Climate warming slows down the growth of the northern forests: currently, the life cycle of trees is longer than the time it will take them to adjust to the unfavourable climate changes. The greenhouse effect will cause extensive zones of the Earth to become unsuitable for vegetation. Furthermore, the increase in temperature will lead to the intensive reproduction of forest pests, and consequently forest destruction. The overall increase in the Earth’s temperature is causing wildfires in some regions. The main danger is that wildfires also constitute a large source of carbon dioxide emissions, which aggravates the greenhouse effect. Areas subject to wildfires are more vulnerable than others to the consequences. The carbon dioxide content in the air increases, and the flora habitat, which is a natural CO2 absorber decreases, thus having a detrimental effect on human health and farming. Various computer models predict that in the 21st century the Earth’s average temperature will increase from between 1.8 to 4.0 degrees Celsius. Presumably, climate change will affect regions differently. It is expected that the temperature will be higher on land, than at sea, and higher in the northern latitudes, than in the tropics. Therefore, humanity needs to make more motivated decisions regarding global warming control. However, the likelihood of achieving this goal is rapidly decreasing with each passing year. A recent report by the IPCC (Intergovernmental Panel on Climate Change) shows that there is only a five-percent probability that we will be able to keep the average increase in global temperature within two degrees. In order to achieve this and prevent irreversible consequences, we need to work quickly: humanity must begin reducing greenhouse gas emissions within the next two-three years in order to meet the goal of the Paris Agreement. According to IPCC forecasts, if no measures are taken, by the beginning of the 22nd century, the Earth’s temperature will be 5 degrees Celsius higher than it is today. Global warming is causing water evaporation acceleration, which, in turn, speeds up water circulation in nature. In 1980-2010, a record amount of precipitation was observed, which was 12% higher than the preindustrial precipitation level. In Southeast Asia, the amount of precipitation has increased by 56%, in Europe by 31%, and in the central regions by 24%. Carbon dioxide and nitrogen are natural components of the atmosphere, but the combustion of such products as coal and oil creates an excessive concentration of these substances, which significantly increases the acidity of rainfall. The environmental consequences of acid rain can be most vividly seen in aqueous environments, such as rivers, swamps and lakes. It has a detrimental effect on fish and other living organisms. This is caused by an increased aluminium content, which rain water washes out of clay-rich soils and is then runs into the waterways. Some types of organisms can survive in moderately acidic water, but other types, which serve as food for the top food chains, cannot withstand such a concentration. This leads to disruption of the food chain, which can be fatal to the ecosystem. Acid rain also has an impact on the growth of plants. By washing nutrients essential to plants from the soil, acid rain creates an environment that cannot sustain plant life. In the mountains, the leaves of trees are subjected to acidic fallout from fog and clouds, depriving them of nutrients and making the leaves incapable of absorbing sunlight, which increases their vulnerability to low temperatures. As a result, the decrease in plant populations means that a certain amount of carbon dioxide will not be absorbed by plants, which will lead to an even higher concentration of CO2 in the atmosphere. Farming will undergo great difficulties. Acid rain affects both the quality and yield of agricultural production. In addition to causing cosmetic damage, acid rain reduces the nutritional value and mineral wealth of fruit. Acid rain also has a detrimental effect on human health: as such it is harmless, but if it gets into the lungs, the small particles created by the rain and ozone can cause or aggravate respiratory diseases, such as asthma and bronchitis. Climate change and a rise in temperature will have a different impact on different regions. For Africa, which is undergoing unprecedented population growth, a rise in temperature will mean larger drought-inflicted areas, leading to potential migration due to water shortage and farming failure. For example, the Province of Sind (Pakistan, the Middle East) has experienced two contradictory consequences of climate change. Extreme drought and flooding make it impossible to grow crops and feed animals, leading to multimillion economic losses for the region. Such Middle Eastern countries as the UAE, Saudi Arabia, Bahrain, and Qatar are in danger of becoming unsuitable for life. According to the estimates of climatologists, by 2070 the atmospheric temperature in the Gulf States could reach 70-80 degrees Celsius. Of course, in large cities the problem can be solved by means of a developed air conditioning system, but even then people will only be able to go outside at night. A radical change in temperature could mean that by 2080 600 million people will face starvation. Starvation and water shortage will provoke the mass migration of insects to northern latitudes, where tropical epidemics, such as fever and malaria, could erupt. It stands to reason that climate changes will also aggravate political differences and conflicts over access to water and food resources. In Northern Europe, the higher temperature are causing warmer winters, which means a higher level of rainfall, more clouds, more strong gales and considerable changes in the environment. Farm land will become too damp for growing crops, and the sea level will continue to rise. In September 2017, the southeast coast of the U.S. was hit by two major hurricanes, one of which was called Irma. Climate changes have led to hurricanes becoming more extreme because of the higher level of precipitation and storm tides. There can be no doubt that the destructive scope of hurricanes will continue to increase in the future. If the temperature rises 2 degrees Celsius above the pre-industrial level, water supply in regions of the Mediterranean will decrease by 50%. For example, reservoirs in France are drying out, forcing the authorities to introduce water restrictions. The Earth’s coastal areas will be destroyed. Buildings and other infrastructure will be washed away by the sea, which will lead to an increase in insurance premiums. The risks associated with flooding are currently the main natural phenomenon forcing people to leave their homes every year. Every year floods leave an average of 22.5 million people homeless. If measures are not taken to reduce greenhouse gas emissions, this figure may double. China and Japan, where about 140 and 30 million people live, respectively, could be left without sufficient housing. 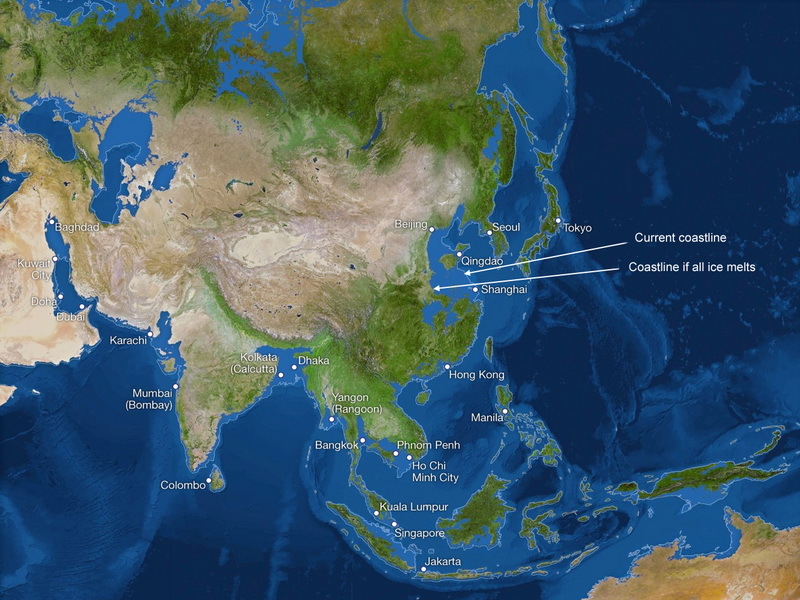 Bangladesh is also at risk because of the rise in sea level. It is expected that by 2050 tens of millions of people will be homeless. The climate in Russia is also undergoing perceptible change, abnormally high and low temperatures are being recorded with increasing frequency. According to the Ministry of Natural Resources and Environmental Protection of the Russian Federation, between 1990 and 2010 the number of natural disasters, such as flooding, landslides, and hurricanes, has increased four-fold and continues to increase by 6-7% every year. The thawing of glaciers in Greenland and Antarctica is natural process, however global warming is considerably speeding up this activity, thus leading to the sudden loss of a large amount of ice. This could have an impact on the rise in sea level and the circulation of sea water. 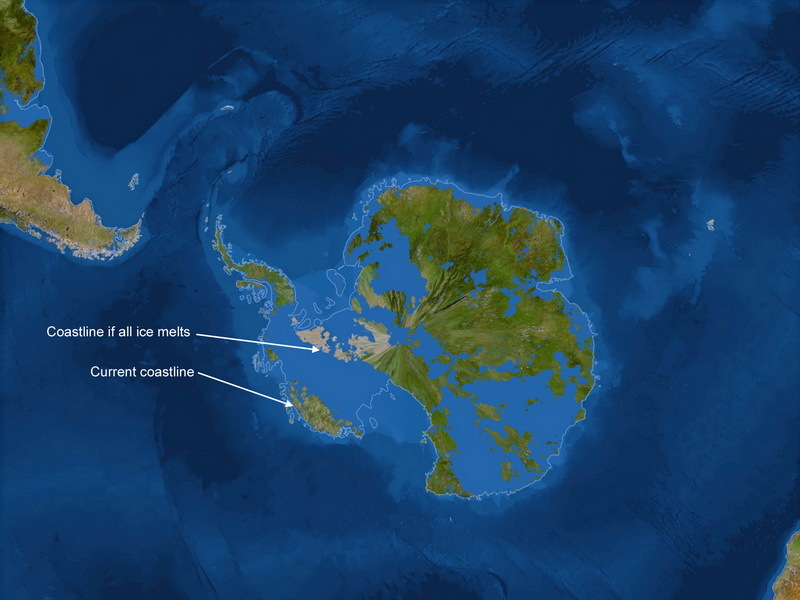 Furthermore, Antarctic ice contains a large amount of methane, a resilient greenhouse gas. The thawing of ice will lead to an all-out emission of methane, which will not only increase global warming manifold, but also lead to environmental disaster. According to some scientists, humanity is currently seeing the mass extinction of animals, the sixth occurrence of this kind in the Earth’s history. This time it is related to human activity. According to the forecasts, the global ecosystem may lose 30-40% of its animal and plant species, since their habitat will change faster than their ability to adapt to the new living conditions. According to the estimates of researchers, the thawing of glaciers will cause the land to sink into the ocean at a rate of three-four millimetres a year. Scientists believe that this rate will accelerate and, in the next decades, the glacial cover will begin receding at a faster rate. 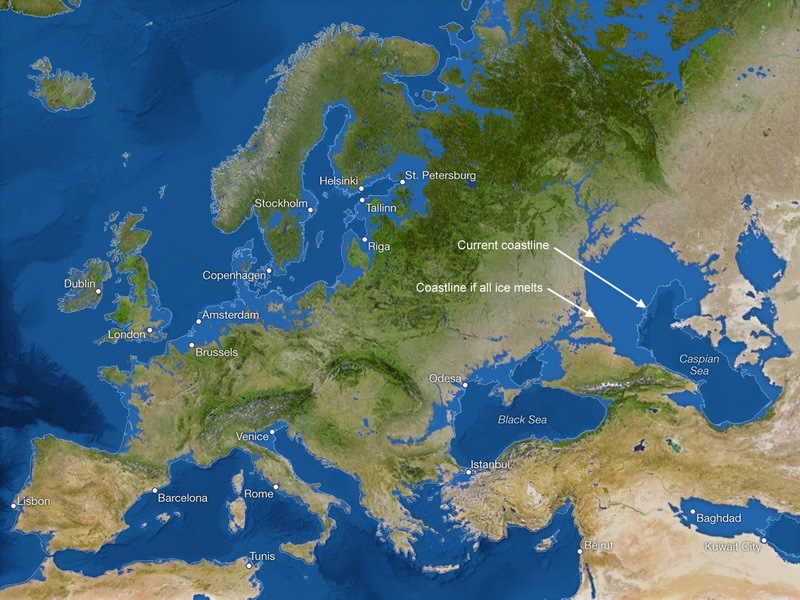 Depending on various scenarios (which take into consideration different volumes of anthropogenic greenhouse gas emissions), the sea level will rise by 0.3-2 meters by 2100. Whereas in the past, the land was covered by a five-metre layer of water every 100 years, now, according to the results of a research study published in Scientific Reports magazine, this will happen every 25 years. Major flooding is more likely in the tropics. 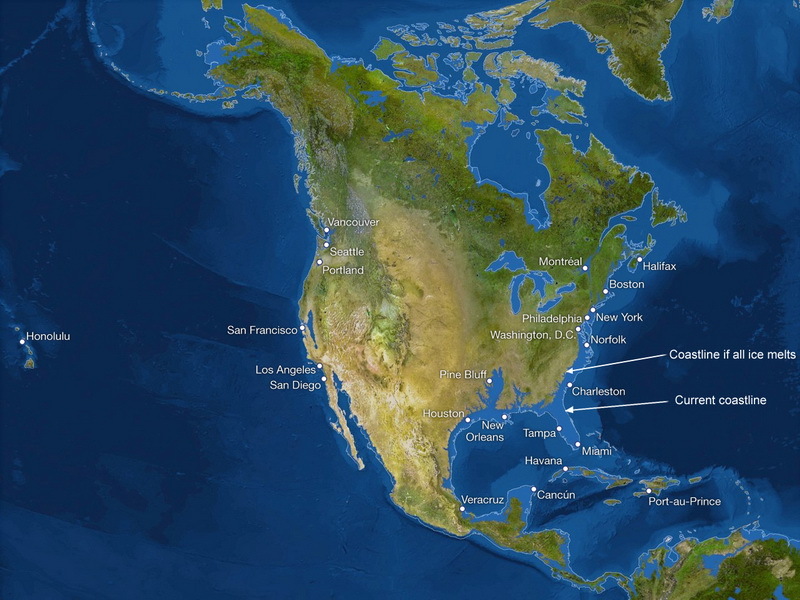 There the frequency of natural disasters will double by 2030 (if the sea level rises by 5-10 centimetres). So island dwellers are the most vulnerable members of the Earth’s population. Climate change causes hundreds of thousands of deaths worldwide every year. Humanity is now faced with the urgent prospect of making decisions that will effectively soften the consequences of ongoing climate change. Both the quantity and duration of heat waves is rising, as well as the number of heat strokes and fatal cases associated with them. Large cities worldwide bear the brunt of heat waves, since the greenhouse effect is particularly virulent in them during the summer. It would seem that the developed countries have long forgotten about certain diseases. But American scientists have begun sounding the alarm: U.S. residents will become more and more susceptible to Dengue fever and malaria. Although the sea level is rising, the availability of fresh water is constantly on the decline. This is because the ice fields are melting and droughts are becoming more frequent. Extreme weather conditions are expected to increase with each passing year. For example, tropical storms will occur more frequently and will be more destructive. If the climate continues to change at the current rate, there will be a sharp decrease in the number coral reefs in the ocean by 2050. Warm stagnant air in the cities increases the formation of a ground smog. Half of the population of the developed countries already lives in the cities where the air quality does not meet the established standards, while in China it has already become a national disaster. Some island countries are already considering evacuation plans. 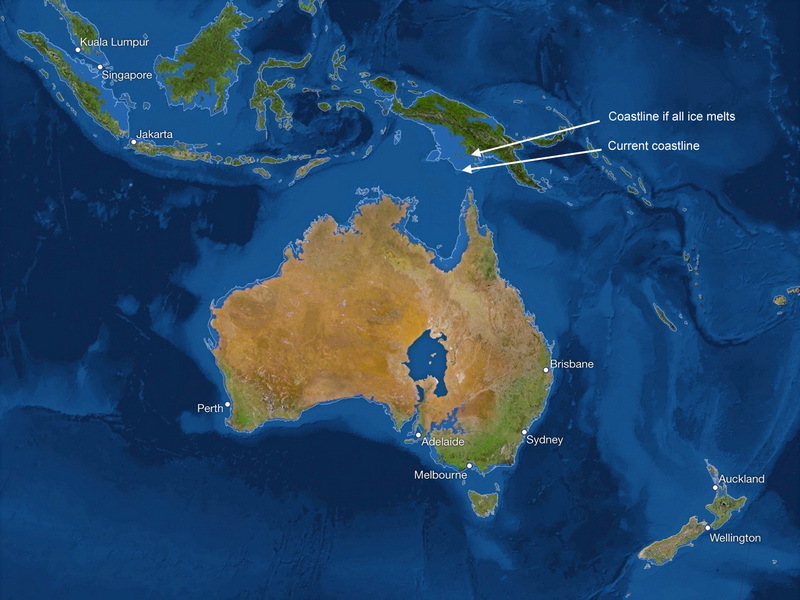 For example, Tuvalu has entered an agreement with New Zealand regarding resettlement of its residents to this country in the event of total submergence of the Tuvalu islands, which are disappearing under water at a faster rate every year. Map of the changes in the coastlines of continents (Appendix 2). Climate change is causing many countries immense financial detriment. According to forecasts, by 2030 the world economy will lose $700 billion due to spending measures relating to climate change. The allergy season is becoming increasingly longer. It is having an adverse effect on the respiratory organs of those who suffer from allergies (which applies to nearly half of the population). Soon food problems may arise. First, the higher temperatures will increase the spread of food diseases, such as salmonellosis. And second, crop production is strongly influenced worldwide by droughts. Global harvests of wheat and corn are already on the decline. Extreme weather conditions and reduced agricultural production in the developing countries will begin to cause more conflicts and migration. And the opening of maritime routes in the Arctic, due to the receding ice, may lead to problems of sovereignty and international conflicts. Larger desert areas and the rise in sea level will also lead to demographic and political problems related to a higher migration level. Many of the changes the planet is undergoing are irreversible. For example, different types of flora and fauna are entirely disappearing. By 2050, the Arctic will be almost completely ice-free during the summer. Children, elderly and poor people will suffer the worst consequences of climate change, since they will be unable to cope with the abrupt changes in the availability of food and living conditions. Climate change will most likely polarize society into those who will be able to cope with it (the richer countries) and those who will be unable to do this (the poor countries). The IPCC (Intergovernmental Panel on Climate Change) has published quite a horrendous forecast. If its predictions regarding the temperature prove to be true, by the end of the 21st century up to 30% of flora and fauna will have become extinct. If humanity does not take measures to reduce greenhouse gas emissions, our planet is doomed. In order to curb global warming and prevent the temperature from rising higher than two degrees above the preindustrial level, greenhouse gas emissions must be reduced by at least half. This will make it possible to decrease the significantly pernicious effect of global warming in the future. If nothing is done, in 50 years the average increase in the Earth’s temperature will reach 4-6 degrees Celsius, which means a destructive rise in the sea level, extreme weather conditions and lack of food security. According to PwC analysts, since the beginning of the century, Russia has reduced greenhouse gas emissions on average by 3.6% a year, Great Britain by 3.3%, and the U.S. by 2.3%. The average annual decrease in emissions over the last 15 years amounts to 1.3%, but these efforts are not enough. To prevent irreversible climate changes, carbon dioxide emissions must be reduced by no less than 6.3%. 1. A decrease in CO2 emissions by 65% of the world value of 32.3 billion tons/year. 2. A decrease in volumes of oil production and refining. 3. A guaranteed reduction in the anthropogenic impact on the global environment and climate change. The risks associated with environmental pollution and climate change on the planet caused by fuel combustion and oil processing are currently underestimated. This document aims to establish a methodological basis for calculating pollutant emissions during oil refining and fuel combustion at coal and oil power stations, as well as during the operation of motor transport and maritime traffic. It sets forth the method for calculating pollutant emissions using a procedure based on specific emission factors. The results obtained in this document are used to assess global climate change, as well as adopt a set of measures to further reduce the negative impact of pollutants on the environment. A = global electricity production (TWhr). It follows that coal-fired power plants produced 9,960 TWhr of electricity in 2016. Generating electricity with a capacity of 1 MW requires 400-600 kg of coal, depending on its quality. For the present calculations, the average value is 500 kg.3 Electricity produced by coal-fired power plants is calculated by dividing the capacity generated by the number of hours per year. There are 365.2425 days and 8,766.05 hours in one year, respectively. First, the amount of electricity generated must be divided by the number of hours in a year in order to obtain the capacity. T = number of hours per year (hours). The total capacity amounts to 2.84 TW. Thus, we find the capacity generated by coal-fired power plants in the same way as in formula (1). Where Ny is the capacity produced by coal-fired power plants (TW). Next, we find the amount of coal needed to produce 1.136 TW of electricity. Vy = 1,136,000 * 500 * 8766.05 = 4,979 * 1012 = 4,979,000,000,000 kg. Thus, the global coal consumption required for generating electricity amounted to 4,979 million tonnes. It should be noted that total coal production and consumption in 2016 amounted to 7,286 and 7,406 million tonnes, respectively.4 Consequently, 67% or 2/3 of all coal consumed goes to generating electricity alone. The above procedure also applies to calculating refined petroleum product consumption for generating electricity. It follows that oil power stations in 2016 generated 996 TWhr of electricity. On average, 0.0016 barrels of oil are needed to produce 1 kWh of electricity.2 It should be taken into account that 1 barrel of oil is equal to 136 kg or 0.136 tonnes. Voil = the amount of oil required to generate 1 kWh of electricity (barrels). Consequently, the amount of oil required to produce electricity worldwide amounted to 216.7 million tonnes. 1.3 Calculation of pollutant emissions. When burning organic fuels, various combustion products are formed in boiler furnaces, such as carbon oxides COx = CO + CO2, sulphur oxides SOx = SO2 + SO3, nitrogen oxides NOx = NO + NO2, polycyclic aromatic hydrocarbons (PAHs), fluoride compounds, vanadium compounds V2O5, solid particles, etc. (see Table 1). During incomplete combustion of fuel in the furnace, the exhaust gases can also contain hydrocarbons CH4, C2H4, etc. All products of incomplete combustion are harmful. Table 1 - Specific emissions from the combustion of organic fuels in power-plant boilers. Legend: Ap, Sp - respectively, ash and sulphur content of the working fuel mass (%). f) emissions of fly ash and slag → 4,980,000,000 * 0.1 = 498 million tonnes. In 2015, the global motor fleet comprised 1,282 million units, 947 million units of which are cars and 335 million units are trucks and commercial vehicles. K is the conversion factor from BTU to tonnes of oil equivalent. Vrf = (87 * 1,015) * (2.52 * 10-8) = 2,204 million tonnes. Taking into account that the percentages of petrol and diesel fuel are approximately equal, it is possible to assume that 947 million vehicles consumed 1,102 million tonnes, while 335 trucks and commercial vehicles used 1,102 million tonnes of the total petroleum product consumption. Global production of petroleum products amounts to approximately 4,200 million tonnes per year, while about 3,800 million tonnes are consumed.1 It should be noted that more than half, 57%, of all oil products consumed are used by road transport alone. Oi - average volume of emissions from 1 vehicle, tonnes. Or = 1,282,000,000 * 4.67 = 5,986,940,000 tonnes of CO2 equivalent. We also calculate the amount of pollutant emissions using Table 2. Table 2 Specific emissions of pollutants per unit petroleum product. We calculate the emissions for each type of fuel separately. g) benzopyrene (C2OH12) → 1,102,000,000 * (6.1 * 10-8) = 0.000067 million tonnes. g) benzopyrene (C2OH12) → 1,102,000,000 * (6.9 * 10-8) = 0, 000076 million tonnes. g) benzopyrene (C2OH12) → 0.000067 + 0.000076 = 0.00014. Table 2 was used to calculate the pollutant emissions of pollutants from ship power plants. h) benzopyrene (C2OH12) → 361,117,000 * (7.6 * 10-8) = 0.000027 million tonnes. 805.5 / 176.7 = 840 / X, where X is the amount of emissions from U.S. refineries in 2016. X = 184.2 million tonnes. 840 / 184.2 = 4182 / Xi, where Xi is the amount of emissions from oil refineries worldwide in 2016. X = 917 million tonnes. For convenience of calculation, we will first translate barrels into tonnes → 4,182,000,000 * 7.3 = 30,528,600,000 barrels. g) Ammonia emissions → 30,528,600,000 * 0.0271 = 0.83 million tonnes. Oil refineries and petrochemical enterprises pollute all parts of the environment: air, water and soil. The main pollutants are hydrocarbons, hydrogen sulphide, carbon oxides, sulphur dioxide and nitrogen. In reality, however, emissions from the petrochemical industry contain up to 250 chemicals, one third of which represents I and II classes of hazard. This study shows that electricity generation produces the highest level of pollution. Coal-fired power plants alone account for 40% of all emissions from fuel combustion. Oil power plants account for 2% of the total emissions from fuel combustion. Transport plays a significant role in pollution of the environment. Road transport alone accounts for 18% of the total emissions from fuel combustion. The global maritime fleet has a detrimental effect not only on the atmosphere, but also on water bodies, where a large part of pollutants go. Particular attention was given to oil refineries, the impact of which on the environment is not so much due to fuel combustion, as to the processing of petroleum products. If alternative energy sources can be used, this will significantly reduce the need for oil production and refining. The Appendix 1 presents a summary table of pollutant emissions from fuel combustion and oil refining by economic sector and fuel type. 5. Energy Information Administration (EIA). Global Transportation Energy Consumption: Examination of Scenarios to 2040 using ITEDD, 2017, p. 7. 7. IMO (International Maritime Organization) - IMO (International Maritime Organization), Third IMO GHG Study, 2014, p. 71. 9. EPA - The U.S. Environmental Protection Agency. 2013 GHGRP Industrial Profiles. Petroleum Refineries, p. 2. 10. EPA - The U.S. Environmental Protection Agency. AP-42, Section 5.1: Petroleum Refining.